By now you may be tired of hearing about rainbows from me. I'm almost done, really. Let's recap what I've talked about so far. There was the rainbow cake I made when Boo turned five this past January along with her rainbow party. Then I shared the pattern for rainbow scarf I crocheted for her. Today it is wrapping with rainbows. 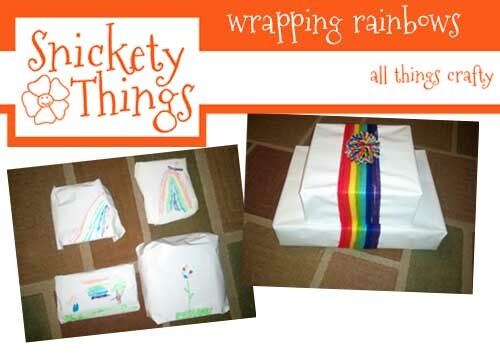 I like to wrap the presents we give the girls (and my niece) on their birthdays in the same theme their party will be. 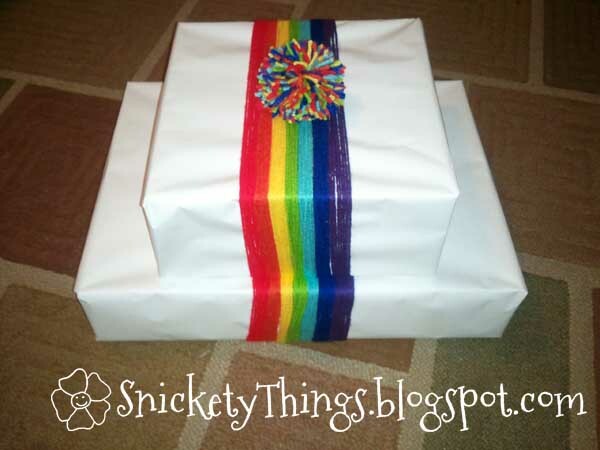 I looked all over for rainbow wrapping paper, but was having no luck. I did have a lot of white wrapping paper I keep on hand. I also had all the yarn left over from the scarf. Put them together and you get this. The above boxes are wrapped separately in white paper. I then just wrapped a bunch of yarn of each color around the package and placed the strands out flat. To hold the ends I just knotted them together. I then stacked both boxes on top of each other adjusting the yarn to be even in the picture. The "bow" is just a large pom pom I made with all the yarn colors. This wasn't all. 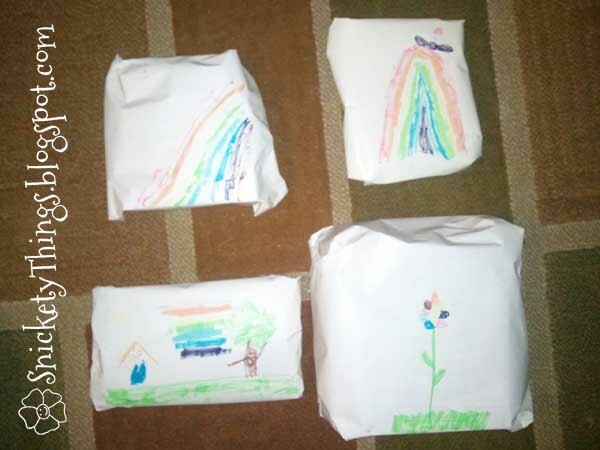 The Princess wanted to get in on it so she decided to draw different rainbows and rainbow colored things on the items she wrapped for her sister. Here is how hers looked. I let her wrap each item herself using the white paper. She just used some markers to draw her pictures. The markers were a bit old so they did not show up very dark, but I think hers turned out pretty cute and I am very glad she wanted to please her sister. I love looking for creative wrapping methods. Love how colorful this is! very cute! newest follower - love you to come visit me too for some more crafty fun! Great idea with the yarn! What a great way to wrap a gift. Wish I had seen this for my daughter's rainbow birthday. Thank you! Wrapping presents is one of my favorite things. How fun. I love the children's drawings too. Thanks so much for sharing on Fabulous Friday at Faith, Trust, & Pixie Dust.